On Saturday, August 12, 2017, people protested against racism and bigotry as it existed in Emancipation Park, which was formerly known as Lee Park after Confederate General Robert E. Lee, in Charlottesville Virginia. 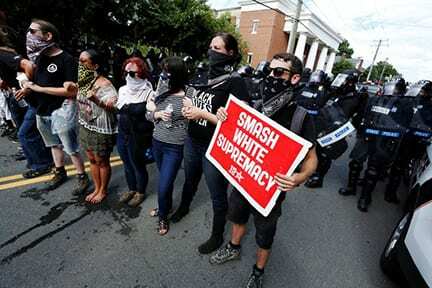 Fascists, members of the Alt-right, Neo-Nazis, the KKK and several other groups determined to spread a message of hate were confronted by people of different races, ethnic groups and economic stations and educational backgrounds who were more determined to spread a message of love, toleration and cooperation. Many democrats and republicans condemned the deportable actions of these who organized the Unite the Right event. I applaud those who organized the counter-protest because they recognized that silence means agreement. I applaud those who embodied the message of Dr. Martin Luther King Jr.: Injustice anywhere is a threat to justice everywhere. I admire those who sought to embrace the teaching s of Jesus who said that we should try to love our neighbors (Mark 12:31) and love our enemies (Matthew 5:44). If we are to truly form a more perfect union, it is we who must confront and resist hate and bigotry where it may be found.